California Gov. Jerry Brown ordered DNA tests that a condemned inmate says could clear him in a 35-year-old quadruple murder case, which has drawn national attention. Cooper was convicted in 1985 of killing Doug and Peggy Ryen, their 10-year-old daughter, Jessica, and 11-year-old neighbor, Christopher Hughes. Prosecutors say Cooper's claims of innocence have been disproved multiple times, including by prior DNA testing, but Cooper and his attorney argue evidence against him was planted. "I take no position as to Mr. Cooper's guilt or innocence at this time, but colorable factual questions have been raised about whether advances in DNA technology warrant limited retesting of certain physical evidence in this case," Brown wrote in his executive order. New York Times' columnist Nicholas Kristof, U.S. Sen. Kamala Harris, state Treasurer John Chiang and reality television star Kim Kardashian are among those who called for Brown to order new DNA tests. Brown's Christmas Eve order came alongside 143 pardons and 131 commutations, in keeping with Brown's tradition of granting clemency on or near major holidays. Among Brown's pardons are five refugees from Cambodia and an immigrant from Honduras all facing the possibility of deportation because of criminal convictions, two people who lost their homes in a recent wildfire and a former state official. His commutations included several former gang members who have renounced their former ties and will now have an opportunity to petition the parole board for early release. The brother of San Francisco Mayor London Breed was not pardoned, despite the family's request. Napoleon Brown is serving a 44-year sentence for manslaughter. Gov. 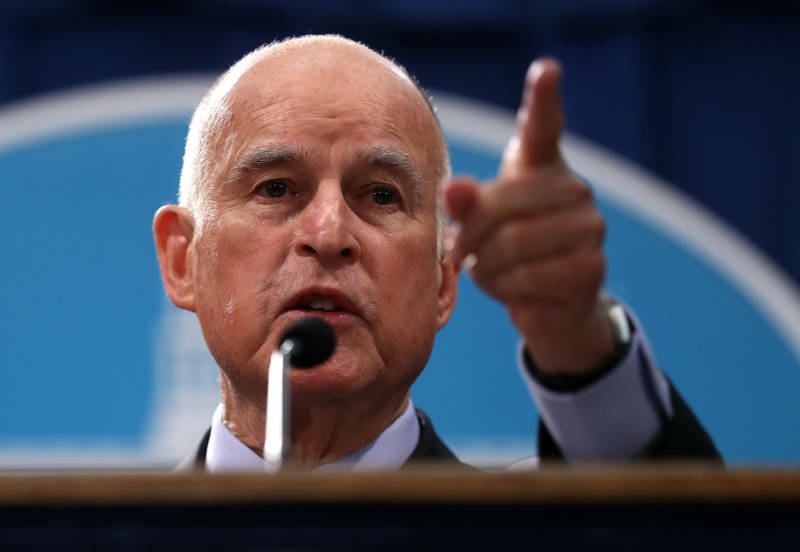 Brown has granted 283 commutations and 1,332 pardons since returning to office in 2011, far more than any California governor since at least the 1940s. The governor needs approval from the state Supreme Court to pardon or commute the sentence of anyone twice convicted of a felony. The court in recent weeks has rejected seven clemency requests by the governor, including one on Monday. In the Cooper case, the purpose of the new testing is to determine whether DNA of any other identifiable suspect is on the items. If the tests reveal no new DNA or some that cannot be traced to a person, "this matter should be closed," Brown wrote. Two previous tests showed Cooper, 60, was the killer, argued San Bernardino County District Attorney Mike Ramos. He previously said the tests proved Cooper had been in the home of the Ryens, smoked cigarettes in their stolen station wagon, and that Cooper's blood and the blood of at least one victim was on a T-shirt found by the side of a road leading away from the murders. Cooper's attorney, Norman Hile, said his client's blood was planted on the T-shirt and that more sensitive DNA testing would show who wore it. He contends that investigators also planted other evidence to frame his client, a young black man who escaped from a nearby prison east of Los Angeles two days before the murders. Other evidence points to the killers being white or Hispanic, Cooper's supporters say. A San Diego judge in 2011 blocked Cooper's request for a third round of DNA testing. Cooper's scheduled execution in 2004 was stayed when a federal appellate court in San Francisco called for further review of the scientific evidence, but his appeals have been rejected by both the California and U.S. Supreme Courts. Former Gov. Arnold Schwarzenegger twice denied Cooper's clemency petitions. California hasn't executed anyone since 2006. — Sophanareth Sok, a Cambodian refugee convicted of voluntary manslaughter after he participated at age 14 in a drive-by gang shooting that killed one person, according to Brown's office. He was sentenced in 1997 and discharged in 2012. Brown said Sok now serves as a volunteer to help ex-convicts re-enter the community. — Kyle Hathaway and Dee Heather Steels Burnett, who lost their homes in Paradise during the November wildfire, according to the governor's office. Both were convicted of drug crimes and finished their sentences more than 10 years ago, and Burnett is now an addiction counselor. Her husband, Jason James Burnett, also had a drug conviction and was pardoned by Brown last month. Associated Press journalist Sudhin Thanawala in San Francisco contributed to this report.